In a single word, NO. 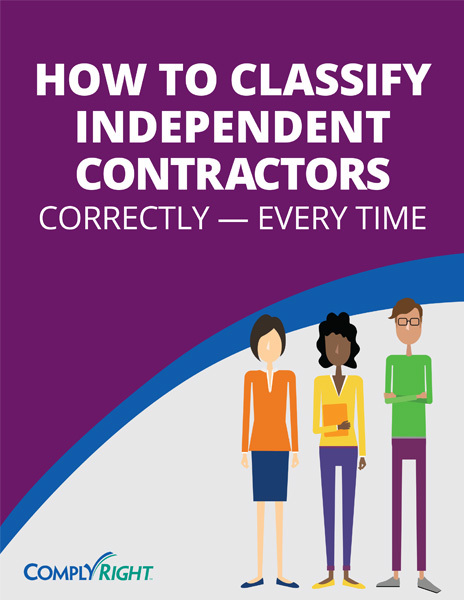 In fact, the very definition of an independent contractor precludes an employee relationship. The key distinction lies in the term, “independent” — which refers to the worker’s ability to make a broad range of decisions about how the work gets done without input from the business that hires that worker. How to get the work done. An employer can dictate to an employee how to accomplish a task – for example, what steps to take, in what order – and often provides training to accomplish that task. An independent contractor is assumed to require no training or instructions, and has the freedom to determine exactly how he or she will accomplish the project or achieve the result required in order to be paid. What tools and other resources to use. Typically, an employee is provided the tools and resources needed to do the job – whether that be office supplies, a computer, a vehicle, specialized equipment or machinery, or even staff to assist with the task. 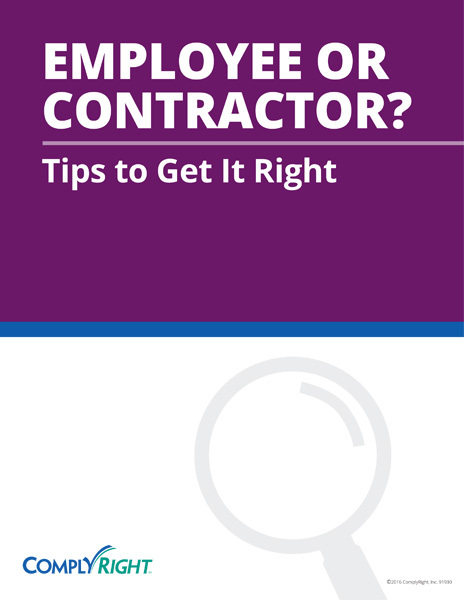 An independent contractor uses his or her own tools and equipment, and decides whether to hire staff to help complete the project – and can even delegate the work to hired help. How to make a profit. 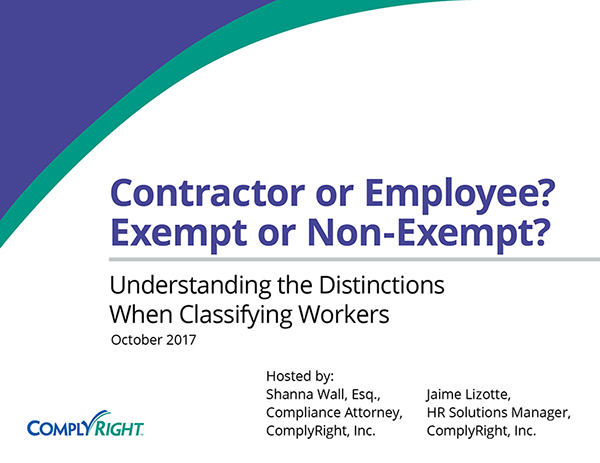 This is one of the most telling factors in determining whether a worker is an independent contractor or an employee. A worker gets paid for the time worked, no matter the outcome or quality of the work. And because the employee doesn’t pay for tools, equipment, helpers or other business expenses, he or she bears no financial risk. 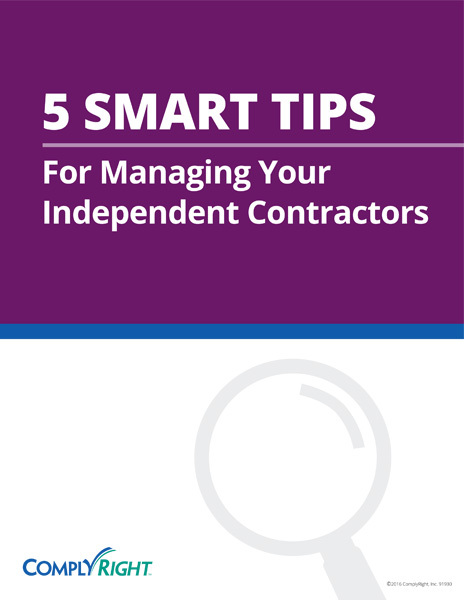 An independent contractor, on the other hand, typically only gets paid if and when the work is completed as promised, and may or may not make a profit depending on how well he or she manages business expenses on that project or overall. The relationship is temporary. An employee relationship is typically indefinite, while an independent contractor is hired to complete a specific project or deliverable. The project could be long-term –years, even (in the case of a complex technology project, for example) – but there is clear agreement on when the project will be completed. The work done by the contractor is not essential to the business. Employees should be used to perform the core functions of a business, while independent contractors can be used for support tasks. As an example, a graphic design agency should not use independent contractors to perform the design function for clients, but a manufacturing firm might use an independent contractor to design its business cards, website and advertisements. The worker is free to pursue other work. Employees can be restricted from having another job, while independent contractors cannot. In fact, it’s best if your independent contractors are established businesses that advertise and offer services to the general public. The worker can’t be disciplined or fired at will. In most states and under most circumstances, an employee can be terminated at any time, for any reason, as long as it’s not an illegal one (such as discrimination). The same goes for employees – they can typically quit at any time, for any reason, without invoking legal issues. 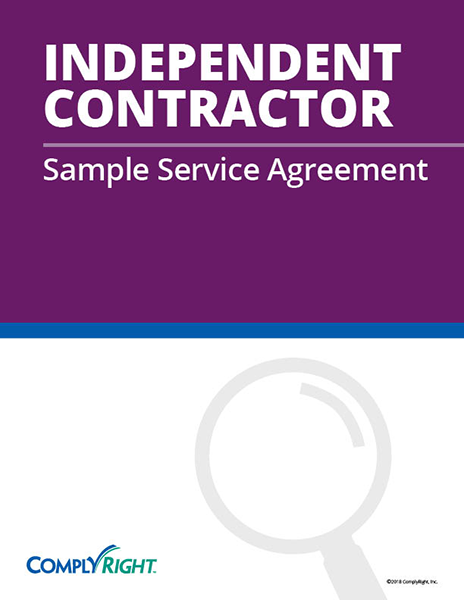 An independent contractor, on the other hand, is governed by a contract that calls for a certain deliverable be completed on behalf of the business. If the contractor fails to perform, the business can seek legal remedy and might not be required to pay, depending on the contract terms. In most cases, though, the business cannot ‘fire’ the contractor on the spot and the contractor cannot ‘quit’ without incurring legal risk. Treating a worker as an independent contractor means you don’t have to withhold payroll taxes, pay workers’ comp insurance or, for the most part, worry about a multitude of employment laws. It also gives you flexibility to bring in help only for the duration of a project, without taking on the overhead of a permanent employee. 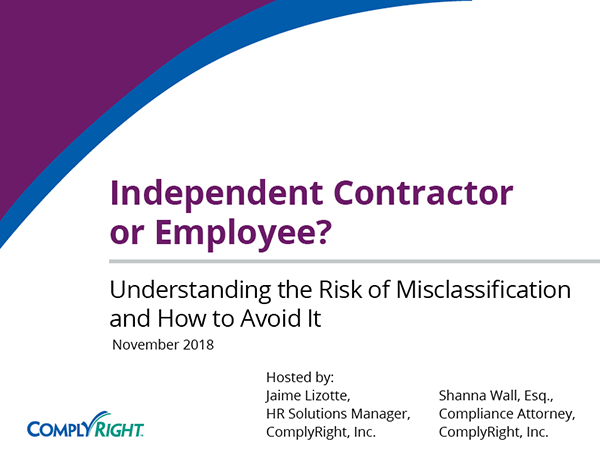 However, it’s crucial to remember that independent contractors must be treated differently than employees to avoid legal repercussions. 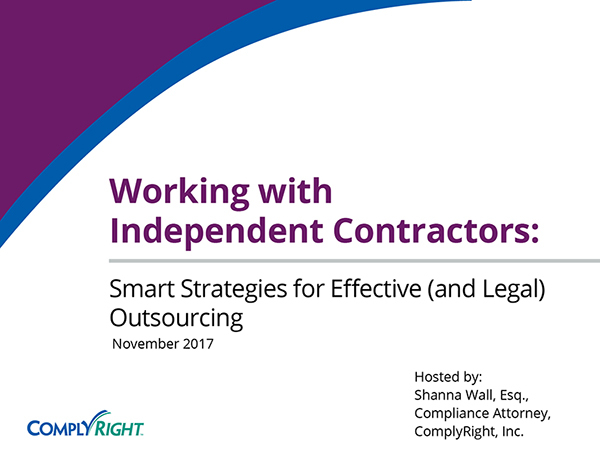 To learn more about how to manage independent contractors without accidentally turning them into employees, watch our free, on-demand webinar, "Working with Independent Contractors: Smart Strategies for Effective and Legal Outsourcing." 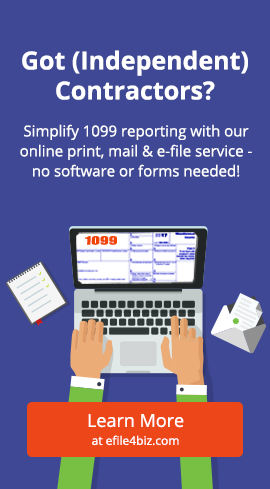 And when you’re ready to file 1099 forms for those independent contractors, turn to efile4biz.com for all-inclusive print, mail and e-file services without the hassle of software and paper forms.